Situated in city centre, this small temple Zhangtho Pelri Phuentsholing Bhutanrepresents the heaven of Guru Rinpoche. On ground floor there are statues of eight manifestations of Guru Rinpoche and paintings on Buddha's life while the next floor contains eight Bodhisattavas and statues of Avalokiteshvara and Shabdrung Ngawang Namgyal. On top floor, there is a main statue of Amitabha. Built in 1646 by Shabdrung Ngawang Namgyal , the first spiritual and temporal ruler of Bhutan, the Dzong houses the monastic body of Paro, the office of the Dzongda (district administrative head) and Thrimpon (judge) of Paro district. The approach to the Dzong is through a traditional covered bridge called Nemi Zam. A walk through the bridge, over a stone inlaid path, offers a good view of the architectural wonder of the Dzong as National Museum Parowell as life around it. 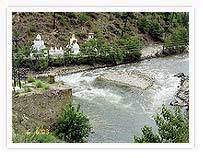 It is also the venue of Paro Tshechu, held once a year in the spring. Ugyen Pelri Palace is in a secluded wooded compound on the south side of the river just west of the Dzong. This Palace was built by the Paro Penlop, Tsering Penjor, in the early 1900s. It is designed after Guru Rinpoche’s celestial paradise, Zangto Pelri, and is one of the most beautiful examples of Bhutanese architecture. Tiger's nest ParoIt is one of the most famous of Bhutan’s monasteries, perched on the side of a cliff 900m above the Paro valley floor. It is said that Guru Rinpoche arrived here on the back of a tigress and meditated at this monastery and hence it is called ‘Tiger’s Nest’. 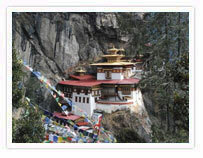 This site has been recognized as a most sacred place and visited by Shabdrung Ngawang Namgyal in 1646 and now visited by all Bhutanese at least once in their lifetime. On 19 April, 1998, a fire severely damaged the main structure of building but now this Bhutanese jewel has been restored to its original splendour. Start the day early for drive to Haa via Chele-la pass. 4 Km away at Bondey village the road to Haa diverts towards the right hand side and ascends towards the chele-la pass starts. After driving through blue pine & rhododendron forest for 45 km, reach Chele-la pass ( 4200 meters). From this point one can have a superb views of Mt. Chomolhari & Jichu Drakey. This is a very good place to walk around for few minutes enjoying the view. Drive on to Haa, descending all the way for another 22 km (under an hours drive), finally reaching Haa. The Haa Dzong is presently occupied by military, but the view from outside is stunning. After picnic lunch visit to the famous Monastery of Lhakhang Karpo (White Temple) followed by visit to Lhakhang Nagpo (Black Temple). The central shrine in Lhakhang Nagpo is said to have no difference with that of Lhasa JOWO in Tibet. The construction of the Lakhang Karpo is believed to have been assisted by the locality. As a result the place came to be locally known as “Hay” meaning” surprise” which later became “Haa” due to the differences in interpretations and pronunciations of different people over time. The three giant hills looming over the fringes of Haa valley were called ”Me Rig Puen Sum” especially after the incidence of the Lhakhang Karpo construction. Today the three hills are popularly known as “Rig Sum Goenpa” signifying three deities-Jambayang Chana Dorji and Chenrizig. Later, other Buddhist saints like Guru Rinpoche and “Machi Labdorn” came to the Jungney Drag in Haa and blessed the locality. The principal religion followed is Drukpa Kagyupa. After the arrival of Shabdrung Ngawang Namgyel, the chief guardian deity of Haa became, Ap Chundu. Later in the afternoon drive to Paro same way back. The drive will be under 3 hours. Chele la (pass), at an elevation 3,988 meters is considered to be one of the highest motorable passes in Bhutan. About an hour’s drive along a thickly-forested road, is this Pass—a botanical paradise. The pass provides stunning views of the sacred mountain Jomolhari and Jichu Drake. It is also marked by hundreds of prayer flags fluttering in the wind. Here, visitors can see cascades of wild roses; purple and yellow primulas; and swathes of deep blue iris covering the forest floor. The top of the pass bloom with rhododendrons in a variety of colours—pale pink, deep pink, burnt orange, mauve, white and scarlet. This stupa was built in 1974 in the memory of Bhutan ‘s third King, His Late Majesty, King Jigme Dorji Wangchuk, who is popularly regarded as Father of modern Bhutan. The paintings and statues inside the monument provide a deep insight into Buddhist philosophy. With the opening of Textile Museum, under the patronage of Her Majesty the Queen Ashi Sangay Choden, Bhutanese textile have reached new heights as one of the most visible distinct art form. The textile museum has opened its exhibition on six major themes - warp pattern weaves, weft pattern weaves, role of textiles in religion, achievements in textile arts, textiles from indigenous fibers and the royal collection. The crowns of Bhutan’s Kings, namzas (dresses), the first version of Royal Crown and other accessories used by members of Royal family can be found in the museum. The goal of the museum is to gradually become a center for textile studies that will carry out documentation, research and studies on Bhutanese textiles. Trachicho Dzong ThimphuAlso know as ‘fortress of the glorious religion’, it was initially built in 1641 and later rebuilt in its present form by King Jigme Dorji Wangchuk in 1965. The Dzong houses, main secretariat building which houses the throne room of His Majesty, the King of Bhutan. The National Assembly Hall is housed in a modern building on the other side of the river from the Dzong. During the warmer summer months, the monk body headed by His Holiness, the Je Khenpo, makes its home in the Dzong. This monastery was founded by Lama Gyalwa Lhanangpa in the 12th century and the present building was built in the 15th century by the ‘Divine Madman’, Lama Drukpa Kunley. In 1616 Shabdrung Ngawang Namgyal visited Tango and meditated in a cave near the monastery. His meditation helped ensure the defeat of an invading Tibetan army. The head Lama, a descendent of Lama Drukpa Kunley presented the goemba to Shabdrung, who carved a sandalwood statue of Chenrezig which he installed in the monastery. The picturesque three-storey tower and several surrounding buildings were built in the 18th century by the eighth Desi, Druk Rabgye and Shabdrung Jigme Chhogyel added the golden roof in the 19th century. 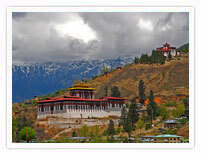 This monastery was built by Shabdrung Ngawang Namgyal in 1620. A silver chorten inside the monastery holds the ashes of Shabdrung’s father. The goemba is situated about half an hour walk from Dodena (alt. 2,600m). The trail commences by crossing a traditional wooden bridge that spans the Thimphu Chhu, then climbs steeply to the monastery. Being the place where the Shabdrung spent many years in meditation, Cheri today has numerous hermitages and small temples located on its slopes, commanding spectacular views. The one way walk to the monastery is approx 4.5 km, taking about 2 hours. The Chimi Lhakhang, situated on a hillock in the centre of the valley, is dedicated to Lama Drukpa Kuenley, who in the late 15th century used humour, songs and outrageous behavior to dramatise his teachings and due to this also known as ‘Divine Madman’. This temple is also known as the temple of fertility. It is widely believed that couples who do not have children and wanting one, if they pray at this temple, they are usually blessed with a child very soon. It is about 30 minute walk across field from the road to the temple. The trail leads across rice fields to the tiny settlement of Pana, meaning ‘field’. It then follows a tiny stream downhill to Yoaka and across more fields before making a short climb to Chimi Lhakhang. Drive towards Punakha Dzong and later walk across the suspension bridge (about 200m long) through absolutely fresh breeze and fascinating view of Dzong. Follow the farm houses gradually climbing towards Dompala hills. The view of Dzong, Pho Chhu, Mo Chhu rivers and surrounding village is superb amidst chirpine forests. The climb is another two and a half hours to Limbukha. Limbukha farmers grow Bhutan’s famous red rice which is supposed to have medicinal values. This particular rice needs clean mountain spring so that the taste is good and nutritional value maintained. 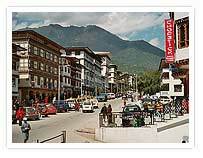 Limbukha is also known for its love of peace and tranquility. Legends says that during medieval wars the ‘limpus’ or the people of Limbukha always volunteered as peace negotiators. This is also depicted during yearly festival called ‘Serda’ when the men are found carrying peace flags instead of swords and fireworks.